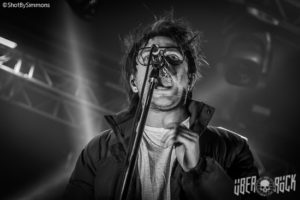 So, the first review for 2019 is already here and this time around Sheffield is the kick off date for a 64-day tour for Enter Shikari. 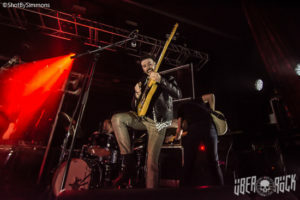 Fizzy Blood are a Leeds-based alternative rock quintet who have been quite busy over the last couple of years. The crowd is very supportive of the Yorkshire lads and are well versed in the choruses of tracks like ‘ADHD’, & ‘Animals’. Energetic and lively the future looks good for these guys. 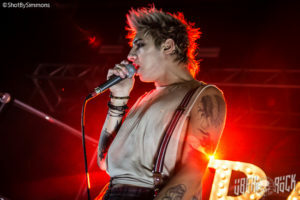 Palaye Royale are a breath of fresh air. This is an interesting mix of punk, classic rock and blues. In some places it reminds of a B-Movie horror soundtrack. Think that Tex-Mex swagger sound in ‘From Dusk Till Dawn’ and you start to get the picture. But just when you get settled into the pace they go and play some bone crushing angry lyrics with riffs that show the piercing angst of teenage and early adulthood. These Canadians have definitely mixed things up and I hope they don’t stop. So, with beer refilled and the stage set…. Lots of smoke and white light with a 30 second quick sing a long and the question “Are you carbon based life forms ready?” asked, Enter Shikari hit the stage like a comet landing and the impact is huge. The room is full and the first confetti cannons have been fired. The keyboard off the cover of the 2017 album “The Spark’ is real and the radar screen actually works is centre stage and gets a real work out through out the night. This is the third time I have seen ES and from a production point this is the best yet. Rou Reynolds is on point and his interaction with Chris, Rob, & Rory is fun to watch. But it is the interaction with the audience as Rou takes them on an inter-dimensional trip that has them angry, happy, sad and dancing all at the same time. By the time the last note was sung and the lights started to dim. One thing is certain…. the rest of the world is in for a treat as ES have never been better. PHOTO CREDIT: All photos © Claire Simmons/Über Rock. You can view our full gallery of photographs HERE. As part of BRITs Week, Enter Shikari play The Dome, Tufnell Park, on Wednesday 13 February, in aid of War Child UK.